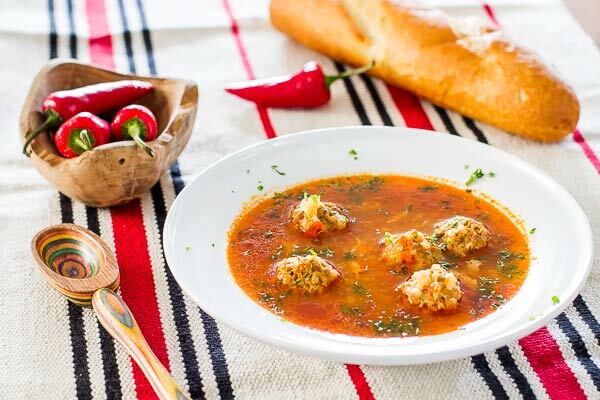 This is definitely the “pièce de résistance” of Romanian cuisine and is also one of the most loved soups, probably shares the top position with tripe soup. I grew up with this thing, it is so traditional that my mom still makes it at least once a month and she’s in her 80’s… beat that! 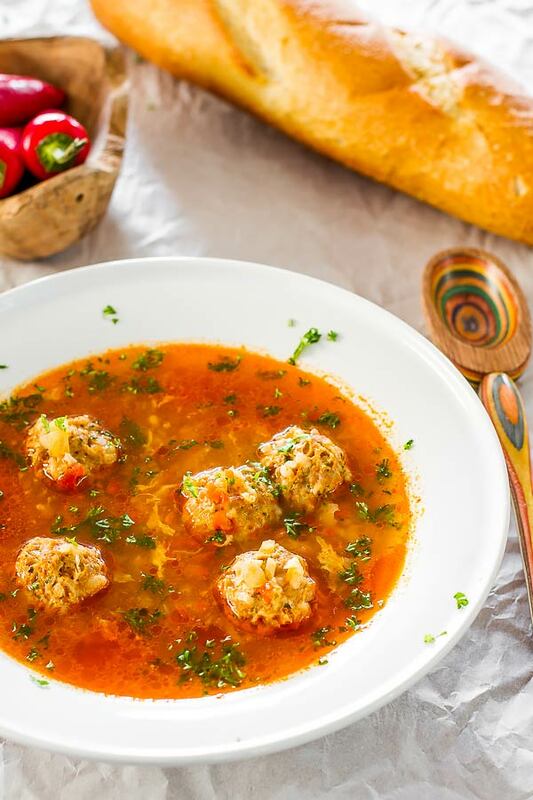 As I said before, in one of my older posts, Romanian soups are different than North American style. They are called “ciorbă” (Romanian pronunciation: [ˈt͡ʃorbə]), and describes a sour soup consisting of various vegetables and meat. Most Romanians differentiate between “supă” (soup) and “ciorbă” by the fact that soup has no added acid and most of the time it’s clear, while “ciorbă” may contain a wide variety of sour ingredients, usually lemon juice, “borş” or “zeamă de varză acră” (Sauerkraut juice). Lovage (a parsley like herb) is a frequent addition which I could not find anywhere in grocery stores in Calgary if my life depended on it. The ingredient I use to make the soup sour is “borş” and this is where everything gets even more complicated. In Romania the word “borş” is derived from the Russian “borscht” but this is where the similarities end. Russian “borscht” is a beetroot soup while in Romania it’s a liquid obtained from fermented wheat bran and used in every “ciorbă” that I know of. Clear as mud? Anyway, in the past years I tried to make “borş” by myself but the wheat bran that I found in grocery stores didn’t actually work for some reason. Luckily, I have lots of family that still live in Romania and one of my sisters was kind enough to send me a replacement of sorts. This thing was amazing and from what I read on the label, it doesn’t have any weird ingredients, furthermore everything was natural and without any preservatives. This envelope also had dry lovage (remember is the parsley like herb) in it which is a must in all Romanian sour soups, imagine my enthusiasm. In the end I used about half of it and my soup came out amazing, just like using old style “borş”. Now the good thing is you can find it on Amazon.com and I got a link ready for you. Unfortunately they don’t deliver to Canada so you are stuck with lemon juice or vinegar, unless you get it from some other place. In Calgary there is one Romanian store that I know of and you might find it there but I am not sure. Also Polish stores are known to carry all sorts of seasonings and spices from Eastern Europe as well so you might try there too. Anyway, on with the recipe now but feel free to email me or leave a comment if any of you need any more info about this recipe. Using some other family member’s hands, mix until everything is well incorporated then form balls of meat as small as desired. Set them aside and start with veggies. I am not a fan of chopping and whatnot to be honest. Not because I don’t know my way in the kitchen but every time I use a knife to cut vegetables I can’t get them as small as I would like so this time I used an IKEA Food Chopper , for the first time actually. It was really great and I managed to get my veggies done in no time and of the right size too. Now add all veggies to a heated soup pot in which you pour one or two tablespoons of olive oil and cook for 10 minutes or until onion becomes translucent. After that you can add about 4qt (4l) of water and bring to a boil then drop the meatballs inside, one by one. Set the heat on medium-high or at least high enough to see the soup boiling but not jumping out of the pot and cook for about an hour or until meatballs are done (you have to taste one every once in a while). The only problem is the rice might cook a bit slower than expected. If you use precooked rice you will probably be done in 30-45 minutes but if you used uncooked kind, like I did, you might be cooking for an hour to an hour and a half. Is not a big deal though, you can easily tell when rice is done. Another thing that you could add at this point in time is extra salt and pepper and maybe some more seasonings. I am addicted to Vegeta Seasoning rather than using stock of any kind, but it’s your choice. When meatballs are done, is time to add the secret ingredient, Bors Magic . I used three teaspoons from the whole package and I think I still have some left for another recipe. Let the soup cook on medium-low heat for another 10 minutes, add some chopped parsley and you are done. You can enjoy it with or without sour cream, your choice. This is it, pretty simple if you ask me but then again, some people really trip themselves in the kitchen. Anyway, it was delicious and if you have a bit of Eastern European bone in you, you need to make this as fast as you can. Also if I missed something from this recipe, it happens all the time :), just send me a message and I’ll fix it right away. Have fun! 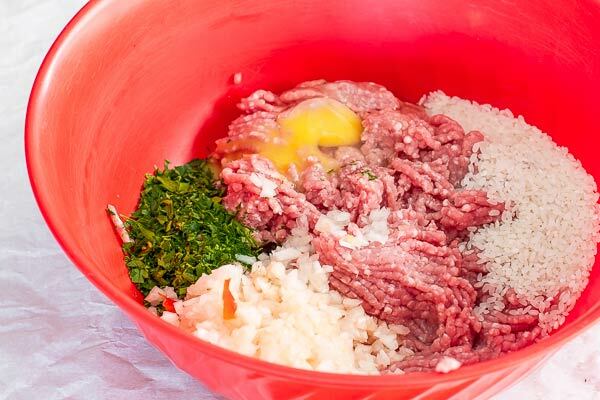 Chop all your veggies then start with the meatballs mix (onions, paprika, parsley, rice, salt and pepper). 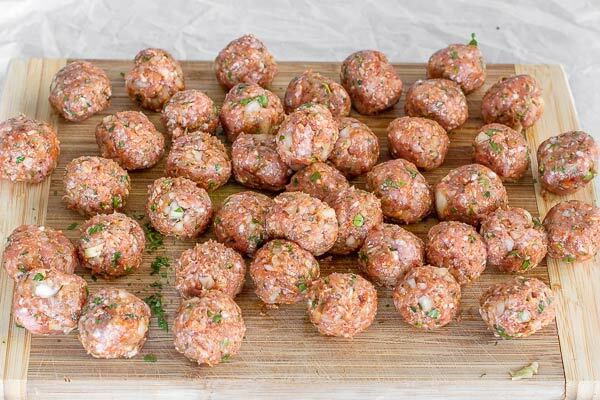 Form small meatballs about 1 inch in diameter, or even smaller, depends on how much patience you have. In a big soup pot, heat the oil and then add the remaining vegetables and fry until the onion is translucent. Add about 12 to 16 cups of water (about 4l). Wait for the soup to start boiling, then add the meatballs one at a time. Keep cooking, when the meatballs are done, they will rise to the top but don't let that fool you, you need to taste them to check if the rice is cooked. Add tomato paste, bors magic, vegeta, salt and pepper and let the soup simmer on medium for another 10-20 minutes. When the soup is done, add the parsley. Serve this hot with a bit of sour cream... or without. I’m heading to Sprouts to purchase these ingredients. I hope this works out. I have a serious craving. I’ve made this soup twice now from your wonderful recipe!!! My husband is Romanian, hence my last name, and since I love to cook I wanted to cook him some delicious Romanian food. This is our go to soup!!!! Thank you so much! I am glad you guys enjoyed it. I love meatball soup myself but I am surely biased. I use dill salt pepper pork pre soaked rice and egg in the meatballs, and boil the veggies in the water, no pre cook. Bor‘s Magic and the luetene packaged from Romania added at the end. All the bors. Was advised to add the meatballs all very quickly and then cook them off. Didn’t do to bad for a country girl from Kentucky. I order lovage from Amazon.com, and I got some seeds to grow some of my own. That’s fine! I used seeds myself but only the second year I got something worth using but then again, it is pretty cold up here. In Calgary you can find lovage in the spring sold in small pots – at the Green Gate store in SW.
Each cup is approximately 250ml, therefore the equivalent of 8-10 cups of Water is 2-2.5 liters and not 4 liters. Outstanding! So peeps actually read my recipes? Woooohooo! No seriously, thanks for your correction. You’re welcome. The soup was delicious!! Maybe! If it seems too much for you, feel free to adjust it. I made for dinner this evening and it was absolutely wonderful! I was in the mood for soups like I had in Romania and this was perfect! I am very excited to try some of your other recipes.